Next time you spy the Big Dipper, keep in mind that there is another star, invisible to the unaided eye, contributing to this constellation. According to a new paper published in The Astrophysical Journal, one of the stars that makes the bend in the ladle's handle, Alcor, has a smaller red dwarf companion. Newly discovered Alcor B orbits its larger sibling and was caught in the act with an innovative technique called "common parallactic motion" by members of Project 1640, an international collaborative team that includes astrophysicists at the American Museum of Natural History, the University of Cambridge's Institute of Astronomy, the California Institute of Technology, and NASA's Jet Propulsion Laboratory. "We used a brand new technique for determining that an object orbits a nearby star, a technique that's a nice nod to Galileo," says Ben R. Oppenheimer, Curator and Professor in the Department of Astrophysics at the Museum. "Galileo showed tremendous foresight. Four hundred years ago, he realized that if Copernicus was right—that the Earth orbits the Sun—they could show it by observing the "parallactic motion" of the nearest stars. Incredibly, Galileo tried to use Alcor to see it but didn't have the necessary precision." If Galileo had been able to see change over time in Alcor's position, he would have had conclusive evidence that Copernicus was right. Parallactic motion is the way nearby stars appear to move in an annual, repeatable pattern relative to much more distant stars, simply because the observer on Earth is circling the Sun and sees these stars from different places over the year. Alcor is a relatively young star twice the mass of the Sun. Stars this massive are relatively rare, short-lived, and bright. 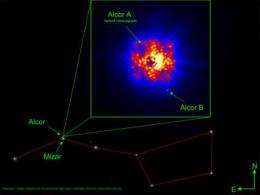 Alcor and its cousins in the Big Dipper formed from the same cloud of matter about 500 million years ago, something unusual for a constellation since most of these patterns in the sky are composed of unrelated stars. Alcor shares a position in the Big Dipper with another star, Mizar. In fact, both stars were used as a common test of eyesight—being able to distinguish "the rider from the horse"—among ancient people. One of Galileo's colleagues observed that Mizar itself is actually a double, the first binary star system resolved by a telescope. Many years later, the two components Mizar A and B were themselves determined each to be tightly orbiting binaries, altogether forming a quadruple system. Now, Alcor, which is near the four stars of the Mizar system, also has a companion. This March, members of Project 1640 attached their coronagraph and adaptive optics to the 200-inch Hale Telescope at the Palomar Observatory in California and pointed to Alcor. "Right away I spotted a faint point of light next to the star," says Neil Zimmerman, a graduate student at Columbia University who is doing his PhD dissertation at the Museum. "No one had reported this object before, and it was very close to Alcor, so we realized it was probably an unknown companion star." The team retuned a few months later and re-imaged the star, hoping to prove that the two stars are companions by mapping the tiny movement of both in relation to very distant background stars as the Earth moves around the Sun, in other words, by mapping its parallactic motion. If the proposed companion were just a background star, it wouldn't move along with Alcor. "We didn't have to wait a whole year to get the results," says Oppenheimer. "We went back 103 days later and found the companion had the same motion as Alcor. Our technique is powerful and much faster than the usual way of confirming that objects in the sky are physically related." The more typical method involves observing the pair of objects over much longer periods of time, even years, to show that the two are moving through space together. Alcor and its newly found, smaller companion Alcor B are both about 80 light-years away and orbit each other every 90 years or more. Over one year, the Alcor pair moves in an ellipse on the sky about 0.08 arc seconds in width because of the Earth's orbit around the Sun. This amount of motion, 0.08 arcsec, is about 1,000 times smaller than the eye can discern, but a fraction of this motion was easily measured by the Project 1640 scientists. The team was also able to determine the color, brightness, and even rough composition of Alcor B because the novel method of observation that Project 1640 uses records images at many different colors simultaneously. The team determined that Alcor B is a common type of M-dwarf star or red dwarf that is about 250 times the mass of Jupiter, or roughly a quarter of the mass of our Sun. The companion is much smaller and cooler than Alcor A. "Red dwarfs are not commonly reported around the brighter higher mass type of star that Alcor is, but we have a hunch that they are actually fairly common," says Oppenheimer. "This discovery shows that even the brightest and most familiar stars in the sky hold secrets we have yet to reveal." The team plans to use parallactic motion again in the future. "We hope to use the same technique to check that other objects we find like exoplanets are truly bound to their host stars," says Zimmerman. "In fact, we anticipate other research groups hunting for exoplanets will also use this technique to speed up the discovery process."